The Lockhart River station began broadcasting on the 5/10/1992 and connected to the Black Star Network on 12/10/2012. Lockhart River is a coastal Aboriginal community on the eastern coast of Cape York Peninsula. It is 800 km north by road from Cairns, within the Iron Range National Park, and approximately 2 km inland from Quintell Beach. The population of 620 people consists mostly of Aboriginal and Torres Strait Islanders. In 1934, people were collected from throughout Cape York and placed on the mission at Lockhart River, which became a centre for the sandalwood trade. With the coming of World War II, the Europeans left and the Aboriginal people were told to go back to the bush and fend for themselves. In 1947, the mission was re-established with drastic changes in how the people should live and behave. Tribal groups were forced to combine into a single community. In 1964, the church handed over the mission to the State Government who tried to relocate the people to Bamaga. The people refused to go, but in 1971 were forced to move away from the traditional area of the coast. 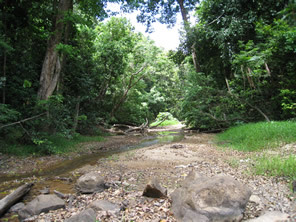 The Lockhart River Aboriginal community is made up from 5 different clan groups: the Wuthathi from the north of Olive River; the Kuuku Ya’u from Lloyd and Weymouth Bays; the Uutaalnganu from the Lockhart River south to Friendly Point; the Umpila from Friendly Point to the Massey River; and the Kaanju from the inland mountain areas behind the coast. Local language is slowing fading out. In 1987 The Lockhart River Community was given ‘Deed of Grant in Trust’ (DOGIT) title of the lands. Locally elected councillors now provide administration for the Lockhart River DOGIT. Lockhart River’s community services include a retail store, a Council workshop (which is run as a private enterprise for vehicle repairs and services), a health clinic, a mail receipt and despatch room, a domestic violence women’s shelter, and a local airport run by the Council. The mission started in 1924 following the death of Hugh Giblet the sandalwood king who had 150 east coast puma working for him during the dry. He was based in Lloyd Bay from 1907 till his death. In 1967 the Anglican Church handed over to the qld govt who immediately moved the settlement to the current site. The State tried to make everyone go to Umagico but the Elders bailed up forcibly to their credit.